Beadhead Woolly Bugger, Standard Woolly Bugger, Sow- bug, Beadhead Hare's Ear, Glo-Bug. The names sound like something out of a science fiction movie, or maybe an entomologist's nightmare. But, to a fly fisherman, the names are pure magic. 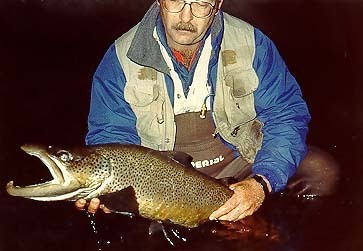 The list is the five most effective lures for the four species of trout found in local waters. Indeed, fly fishing in itself seems a kind of magic to the uninitiated. According to Dale Fulton, former owner-operator of Blue Ribbon Flies in Mountain Home, the art of fly casting is something anyone can do. "I've never met anybody too stupid to fly fish," said Fulton, laughing. "Fly fishing is like riding a bicycle once you learn, you can do it for life. "It's not at all difficult," added Fulton. "I always parallel it with (snow) skiing. You can learn to ski in three days, but after 30 years you still don't know everything there is to know about skiing." And once a person learns how to fly cast, a whole new area of fishing is opened. Rainbow, Brown, Cutthroat and Brook Trout abound, and for those looking for a new challenge, fly fishing fits the bill. "If someone wanted to just get a bunch of fish, all they'd have to do is drop a stick of dynamite in the water," said Fulton . "You're handicapping yourself (with fly fishing). You have to be closer to your quarry, closer to nature - more careful, more deceptive, quieter. Fish are not smart, but they can be difficult to catch. "Most people go through stages (after learning to fly fish). First, they want to catch anything they can, then the most fish," continued Fulton. "Then the goal changes to catching the biggest fish. Usually, if they stick with it, they try for the most challenging, the most difficult fish to catch." And that most difficult fish need not be any exotic species or one of tremendous proportions. Fulton told a tale of an average size brown trout. "He was hanging over a moss-covered rock in a fast part of the river," he said. "He was towards the right side of the rock, but there was no way to get a line in there. The only place you could get to was on the left side. He just waved back and forth over the rock, and after about an hour he finally swerved over on the left, and I dropped a line in, and he casually reached out and took it." Fulton released the fish to return back to its rock. Fulton and his wife, Ronna spent 17 summers in West Yellowstone, Montana, with Dale working as a fly fishing guide, then guide service owner. The Fultons spent their winters here in the Ozarks, before settling here year-round. Ronna is a first-grade teacher at Flippin. Dale, who has a masters degree in zoology from the University of Arkansas operates Fulton's Lodge on the White River and formerly owned Blue Ribbon Fly Shop in Mountain Home. He claims his degree has no bearing at all in his profession. Fulton employs a catch-and-release philosophy and operates his guided fly fishing trips the same way. "We ran between 600 and 700 guided trips a summer in Montana, and killed no fish," he said. "The tourists who come here do what the people around them are doing, so when we catch and release, they usually follow. More and more people utilizing the catch-and-release philosophy has had a profound effect on local waters. Fulton says the number and quality -of fish in the White and Norfork Rivers is better than it has been in quite some time. Trout are also found in the Buffalo River and Crooked Creek when the weather cools off enough for trout to swim up into the tributaries. Other good trout fishing spots are Cane Creek, on the upper part of the Spring River and along the 1l-Point River. Little known, Fulton says from what he's heard, the 11 Point is probably the best of the three. Fulton has been fly fishing since he was eight-years-old, a skill he picked up from his father. Ronna is also an accomplished fly caster, and uses the sport to unwind and relax after school, and there is one of the major attractions towards the sport. Little appears more relaxing, more peaceful, than the rhythm of casting and retrieving, working the area one deems most likely to produce a fish. One need not go to water to enjoy the sport. Some folks just stand in their yards and practice casting. A good caster can put out a line 30 or 40 feet. Professional fly-fishermen can cast up to 100 feet. The sport continues to grow as more and more are attracted to the ancient art of fly fishing, which has its origins in l7th century Europe. Those interested in learning to fly fish can enter at just about any financial level. A complete novice rod-and-reel outfit can be had for between $100 and $170. Some of the better rods have lifetime guarantees against breakage, and some reels can command many hundreds of dollars, but a perfectly usable outfit can be had for much less. Flies, both wet and dry varieties are from about a dollar to around 4 or 5 bucks, depending on the design and the amount of time necessary to create the tiny imitations of life. Or, one can learn to tie their own flies. Thousands of patterns exist, and experimentation can lead to new and better lures. The Woolly Bugger, introduced to the area by Fulton, is so successful it is now used on a national level.